Ratings are averaged based on 66 reviews. Thank you we had a lovely room with great views and location. The staff were very friendly and hospitable. Thoroughly enjoyed our family holiday at Katathani Phuket Beach Resort. Travelled with small children and they had a great time, as did we. We had a junior suite and the rooms are in need of a little updating as they're becoming dated and there's a fair bit of wear of tear occuring. Other than that, the resort incredible. So many dining options, and quality of the food was A+ at the majority of the restaurants. Resort facilities such as the pools and kids club were a hit. So many pools to choose from, the kids were never bored. The water park and kids club were winners. And the sunsets were just perfect....every single night. We got the full board meal plan package which was handy but the voucher system they employ to track meals is clunky at best. Could be something they look at in the future. The daily allowance for each adult was 850 baht for each lunch and dinner, in the end, we struggled to spend that allowance for each meal as the prices for individual meals were reasonable and we didn't eat that much at each meal anyway. I wouldn't get the meals package if we went again. Day Spa was divine and nanny service was helpful. Loved the resort and the staff were so friendly and helpful! kob-khun ka! Ok if you don't mind being out of town. Need to get taxi to go shopping, otherwise a nice quiet spot. Security, house keeping, breakfast and buffet meals were good at the resort. Fabulous location, great amenities with enough to keep kids entertained. Despite the number of guests it accommodates it didn’t feel crowded or busy. Absolutely brilliant resort. Had a Grand Seaview Room. Brilliant size compared to most resorts that we have stayed at. 50 metres from room to beach or Adults pool area. Staff were always polite, especially the breakfast room staff. Very quiet area of Phuket, but only 35 minutes by car to Patong. We highly recommend this resort and look forward to staying again. This was the second time that we have stayed in Katathani owned resort in Thailand. Thank you Katathani Phuket Beach Resort for a wonderful stay. A fantastic, super friendly resort. We stayed in a Grand Deluxe room type which was perfect for our family. The room was a great size, clean and had everything we needed. We had a couple of minor issues on arrival which were resolved within minutes by housekeeping. The room was always serviced to a high standard. We were very close to kids facilities (pool, splash pad, games room and kids club). Breakfast service at the restaurant was fantastic. The resort is massive, making up most of the Kata Noi region. The beach is great for swimming as long as you stick between the flags. Would highly recommend this resort! Absolutely brilliant resort for families. On an amazing beach, great food options, little stores nearby for snacks etc. We would definitely love to go back there. Really great resort for family holiday. Really thought that the location was great for a family holiday and will return. We had one minor issue with the fridge in the room but only minor. Facilities for children were particularly good. Enjoyed our stay. We found the resort a lovely setting, very relaxing and a good escape during the winter months to get away from the cold. Staff were excellent and very helpful. Absolutely loved this resort. Only wish it was a bit closer to home. Our family of 5, 2 adults , children aged 13, 11 and 18 months had the most wonderful relaxing interesting holiday at the Katathani Resort. The staff were so lovely and couldn’t do enough for you. Also with 6 pools including a kids water park and numerous restaurants in and out of the resort meant we were always entertained and never bored. It was great being out of the busy parts of Phuket. Loved it! We can not fault this place at all. Staff are very friendly and happy. You feel nothing but safe here. Very easy to get about and organise trips. This is an excellent family resort for all ages. Great water park for small children, plenty of pools for everyone, well catered games room and kids club and the food was excellent. Can't go wrong with this resort. This was our second stay at Katathani and it was fabulous once again. The resort is beautifully maintained, clean and in a very private, quiet location. Great for kids and families. The beach is safe and clean. The breakfast buffet in the Thani wing has a wide selection and there are also a few restaurants just outside the hotel which serve good quality, well priced meals. I wouldn't hesitate to recommend Katathani and hope I get the chance to stay there again. We had a wonderful stay and love the resort. We enjoyed our time at Kathatani resort. Junior Suites perfect for couples. A little well-loved but clean due to daily service. Beautiful friendly staff. Overall - 9.5/10. Will be going back! Brilliant, can't wait to go back! The resort exceeded our expectations. Such a beautifully kept resort, and the staff were helpful and friendly. The breakfast was lovely. We will definitely be coming back to stay again. We had a restful and happy stay, the staff were great and went above and beyond the call of duty ever expected, we had a phone left in a taxi which was tracked down and returned with a smile many hours after it was lost. The views were great from our Oceanside room. The location was only a few minutes from the main streets of Kata beach and beyond, so no noisy streets and traffic to disrupt the sound of peace at the resort. Really you do not need to leave this lovely place. Sunsets, cocktails by the water and a great place to enjoy a holiday. The only resort we could see on its own private beach and with all the facilities you needed to have a lovely stay. Just be careful of the beach, can be a bit rough in low season from monsoons, always warm and inviting though. This is a great Hotel well serviced by the plentiful staff which operate throughout the resort. there are great facilities and the food was all excellent. overall a great family holiday destination. Relaxing holiday. The only negatives were - breakfast variety not as good as the Moevenpick. Nurse on duty unfriendly and unhelpful, she just did not want to be there!! This trip was our third time in Phuket, so we thought we'd try the Katathani Phuket Beach Resort, after reading reviews and seeing it's location. The beach front location is beautiful, there is nothing better than hearing the sound of the waves crashing. The staff are lovely, warm, welcoming and will do anything for you. Unfortunately, that's where the positivity ended. We stayed in a Grand Suite in the Thani Wing and were 2 adults and 2 children. Upon first inspections the room was clean and had a beautiful view of the ocean. However, you can not open the doors to the balcony to enjoy this view, as the inside of the room gets very wet. The porcelain tiles throughout the entire apartment become very wet and very slippery. The air conditioning could not be turned to warmer, so was freezing during the night. The pillows on the beds needed to be replaced, probably 4 years ago. They were lumpy and had lost any sort of shape or support. The three restaurants we tried at the resort, left us underwhelmed. The staff at the poolside bar were great and the complimentary banana chips were a nice touch. Overall, there are far better options in Phuket. After 3 nights of a planned 10 night stay, we moved to the Movenpick Resort, where we stayed the year before. The staff at Travel Online specifically Kimberley Sheldrick and Michelle McGregor, and Jonothan at the Katathani were all amazing at accommodating our request to move resorts. We were charged 1 nights cancellation fee, which I thought was completely reasonable under the circumstances. Overall a good venue to stay and enjoy Phuket. Food in general for breakfast was very good, however the night that we ate at Chom Talay Roast night was very poor. The beef wellington that i was served was minus the beef, pastry and pate only. Price for meal was double what we paid for outside of the venue, of course not the same menu, but value for money, overpriced for what we had for dinner given the quality. The buffet meals that we selected were all nearing cold and as a result thought that they may not be as food is served at a minimum temperature. My wife and I ran a B&B for 12 years and our food handling training maintained food to be hot, not bordering on cold. We found this to be the same on all of the buffet meals that were part of packages, a little daunting when chicken and rice are 2 items where food can spoil. Ground and surrounds and the beach were great, very clean and the staff were very friendly and helpful. Overall we enjoyed our stay. The room was nice, spacious and clean. There was plenty to do for the kids with the new water playground recently opened and other activities at the kids club. The beach and pools where also nice and clean. The food quality was average and we also had a bit of an issue with the noise level next door. It seems that the room next to us was being renovated and we had called front desk about it but never heard back from them. The noise did stop after a few days. We will probably come back to this resort again. We stayed in a Sea View suite at Katathani for 6 nights in June 2017,we arrived late at night and were checked in smoothly and had no idea what to expect until we opened the curtains the next morning. Wow is all I can say, we were on the 2nd floor overlooking the main pool and the ocean, the room was large and had a very comfy king size bed, fridge and TV. Buffet breakfast included in the price and it was just fabulous, many options to choose from, even a childrens section. I loved the coffee machine where you could make your own latte's, coffee is a big thing for me first thing in the morning and this didn't disappoint. The one thing that did annoy me in this day and age is the Wi-fi not being available in the rooms free of charge, I really don't understand why a resort of this standard could not offer it, a small thing and overall a really wonderful stay. The hotel itself has many restaurants and pools, with a new kids water park attached to the kids club which is great . Couples .... you won't be disappointed . Katathani is a great place to relax, Beautiful beach and pools, And many massage ladies to look after you. Rooms are nice, A little dated but nice and clean. Food is also nice and reasonable prices. Kids club is non existent, Needs to be looked at, It's more like a supervised playground rather than a kids club, If they could get the Kids club right many more families would go to Katathani. Overall a very nice Resort, If you are not travelling with kids, I strongly recommend you try The Shores section of the Katathani, It's kids free and the rooms and restaurant are fantastic. I attended a family wedding at the Resort which was very professionally done and lovely. A perfect venue. While the resort is very large, it somehow maintains an intimate feel. I thoroughly enjoyed my stay and would love to go back. This was our 4th year at Katathani beach resort, this resort has never looked better from the manacured lawns to the 800 mts of prinstine beach the staff are very attentive and friendly the restaurants at the resort are fantastic . Thank you Katathani for a great stay we will be back again next year. We enjoyed a wonderful stay at Katathani Beach Resort. One of the best things is its location. 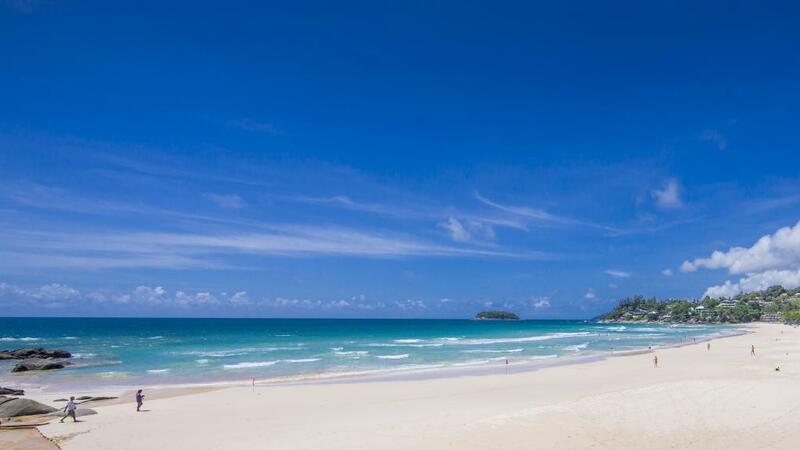 The exclusive Kata Noi Beach is clean and safe, far superior from the larger and polluted Kata Beach. The resort is beautiful, well maintained and very hygienic. Breakfast was great especially the freshly made omelettes and the staff were helpful and friendly. We stayed in a Grand Suite on the top floor with spectacular ocean views and a good size for a family of 4. Outside the hotel are a number of restaurants which are very good value for money and provided quality meals. I wouldn't hesitate in going back to Katathani. Had an amazing time at Katathani - I will DEFINITELY be back. Fantastic, relaxing, memorable stay in a wonderful resort. We have just returned from our 3rd wonderful stay at the Katathani Phuket Beach Resort, and cant wait for the day to return once again. Our family, with 2 boys, stayed in two connecting poolside rooms in the Bhuri wing. Despite other reports, we love this side of the resort, and have stayed on this side on each occassion. It is, IMO, the better side of the resort. We find that it is quieter, not as crowded around the pool, and Breakfast in the Seacret restaurant is definitely not as noisy or busy. It is still close enough to the beach, restaurants, and other pools (should you wish to move around). The rooms are beautifully presented, and we couldn't fault the housekeeping during our 8 night stay. There is plenty of room, they are tastefully decorated, and well laid out. The bathrooms are clean and tidy with good water pressure and temperature. The grounds and pools are immaculately maintained, with a lot of pride and effort going into maintaining them. The food has always been of high quality and well priced - the breakfast buffet is varied and plentiful with lots of choices (love the made to order omelettes). There are plenty of options for dinner also. The Seaside Pizza cafe is great, one of the best pizzas I have had - full of flavour and not at all oily. We love that The Katathani are always updating and adding to this fantastic resort, and it is great to see the changes each time we return. This year we enjoyed the new Joy Zone in the Bhuri wing. This is a great set up, a nice place to hang out and have a drink, while the kids are playing and having fun. There is plenty to do in and around the resort. The games rooms are fantastic. We had fun at the Frog Races. The staff are what make the resort so memorable. They are always fabulous, welcoming, and friendly, and more than happy to assist in any way. The Katathani has, for us, set a benchmark and expectation for which all other stays are measured against. We have travelled around many areas of Thailand, including several stays in Phuket, Khao Lak, and Krabi areas. We always finish our trip with a stay at the Katathani. We keep on returning as we know we wont be disappointed. My wife said that when we come around the back streets of Kata, up over the hill into Kata Noi she feels a sense of relaxation and being "at home" - I think that sums it up. We love the warm welcome back that we receive. We love our time at the Katathani. We couldn't recommend it highly enough. Thank you so much for another memorable holiday, and we look forward to visiting again soon. Thank you too to travelonline for the fantastic deal on the accommodation, which made it all possible. Just returned from an amazing 7 nights at the Katathani with my husband and 2 children - 8 and 6. Resort was perfect for young families with 4 large pools across the resort and a beatiful beach perfect for young children to play and catch waves. All dining venues were great inside the resort including a great pizza restaurant that did cheap takeaway pizza for you to eat at one of the beach bars during the evening happy hour. There are approx 6 restaurants in the quiet street where the resort is located to add to your restaurant choices all you can catch a tuk tuk over the hill to Kata for 200Baht each way or 300 Baht to Karon. Resort has lots of activities to keep the kids occupied including great pools, a large games room and outdoor chess games. Resort has free kids club which we used for an hour here or there but nothing to rave about - kids were bored quite quickly but good option when you need them to have a break from the pool. Staff were very friendly, room very clean although the furniture a little worn. Overall a very enjoyable stay. Would visit again. Resort was great, service at the resort was first rate. All the staff were super helpful and very friendly. Rooms were lovely with great views. We used 4 out of 5 pools and all were clean and beautiful. Food in the resort was average except for breakfast, but restaurants outside the resort and nearby are excellent and very cheap. 3rd time visit and will go again! The best family holiday experience you could wish for. When they say "Welcome to the shores of serenity" that's the perfect description of the resort, peaceful and relaxing. Our teenage daughters were completely safe to swim and explore the resort on their own. There are plenty of restaurants and shopping markets on your doorstep. We have visited 3 times and will be going back again! This was our 3rd stay at Katathani the junior sweet facing the ocean is fantastic,the grounds are beautiful great friendly service and the food in the restaurants is very good, will return next year for the 4th year in a row, love it. Lovely holiday in upmarket, quiet end of Kata beach. Room however needed to be inspected for minor problems ie sticking doors. This being our 2nd visit, we noticed that it appears to be now geared towards Asian guests., especially the breakfasts. We have been here before and enjoyed our stay - great facilities and service. However we noticed this time that the hotel is looking tired and run down and the cost of food/drinks/service is increasing, the beach sand was bee clean but the water was full of rubbish. Won't be rushing back. Beautiful clean and blue beach. Room and buffet breakfast were average at best. Taxis charge more than required as you have no other choice but to walk a while to anything. A great resort for a family holiday. Close enough to get the feeling of Phuket but far enough away from the hustle and bustle of Patong and Kata. The beach here is beautiful with few hawkers trying to sell, ocean is clear and nice to swim in, be careful of the rips, and they have a lifeguard on duty. Lots of different pools to enjoy if you don't want to venture far from the resort. Staff always friendly and obliging. Food is okay in resort, they do have a few places just outside for eating and generally very good. Overall highly recommended for a flop and drop, do nothing holiday!! Great resort on the best beach in the area - but it is the staff that make this resort. Katathani is a 4* resort with a 5* location...the grounds are wonderful and very well kept..staff are always smiling and friendly. Their buffet breakfast is one of the best we've ever experienced. This is our fourth time there and we love opening the curtains every morning and seeing ocean, sand and palm trees staring back at us ?? Relaxing and very comfortable stay. Best holiday ever! Staff amazing and so pleasant. This is the 2nd time our family (2 adults, 2 teenagers) have stayed at this resort in 5 years and we would go back again! It's relaxing and love that you can go out of the complex and there are other options around, ie. restaurants, laundry is able to be washed and folded for next day pickup at very low cost which is fantastic! Only 20 minutes by tuktuk or airconditioned car to main shopping in Patong or 5-10 mins from Kata & Karon for huge choice of restaurants. Food was great, loved the beach so close, room was newly renovated so paint fumes quite bad but staff happily accommodated us and helped make more comfortable. My partner and myself found the Katathani to be exceptional, we had a fantastic time. All the staff were so attentive and helpful, full of smiles and nothing was ever an issue. The grounds to the resort were always being maintained and looked picture perfect. Room was fantastic with clear views of the beautiful blue ocean from the bedroom. Great options of food in the restaurants, and plenty more options outside the front of the resort. It is going to be hard to find a place that beats this one! This is the second time we've stayed at the Katathani. It is a lovely resort for families and the beach is in a quiet part of Phuket but still close to a town. Ideal location really. Seas were rough when we were there this time but in the past the beach has been the highlight for us. It isn't a 5 star resort but met our needs perfectly. Our 2nd stay and we enjoyed it as much as the first time. Possibly the best overall package resort on the island. Great beach, great location, good services. Not to far from the action but far enough away to feel comfortable with your family. Highly recommend if you are traveling to Phuket. Great location on clean surf beach.. Excellent place to stay ticks the box for all aspects. This resort is outstanding. Beautiful beach, immaculate gardens. clean and comfortable rooms. great restaurants, lots for the kids to do, great swimming pools and very helpful and friendly staff. massages, manicures and pedicures available while relaxing around the pool. Would definitely go back again its a paradice. Great place to stay missing being there already . Well above what I was expecting. We went in September and found the weather perfect and the resort quiet while still close to everything needed. The whole holiday far exceeded expectations. This resort is perfect for couples, familys or weddings. One of the few places that has great beach frontage. A great resort. Really happy with the service. Great location with a great beach front. This is one of the few points that you can relax and enjoy without crowd. After 2 nights we paid to upgrade to the beach view side and it was wonderful.